My last blog post ended with the completion of the 55 km Lommeltrail, a trail I deliberately had put in my preparation for the Bello Gallico. Having finished this successfully was a great confidence boost towards the Bello Gallico trail. 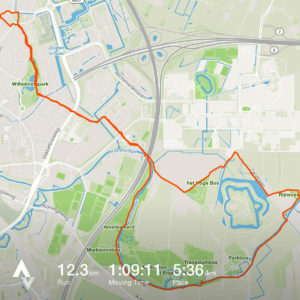 Especially since I wasn’t completely wrecked after it but was able to go for a nice short trailrun on the morning after. 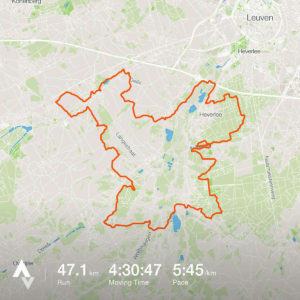 Coming home from the Lommeltrail on Sunday afternoon, my memory takes me back to last year. A year ago I also completed the 55 km Lommeltrail, at that point it was my very first ultra distance. I still remember that Astrid and I went for a short walk the day after because we thought that would be smart to do. After a few hundred meters of wobbling around the area, hardly being able to move our legs we returned to our cottage. Lets just say it took us a while before we were out running again. And this year I had actually managed to go for a run on the day after and everything felt fine. Apparently my body was getting used to these long distance runs. There were 10 days left in November after arriving home, so how did these go in my preparation towards the Bello Gallico trail. At the end of the week (Thursday and Friday) I would be at a work related conference, something I was really looking forward to but it also meant that I won’t be able to do a lot of running on those days. Which basically meant that I needed to get my long runs in at the beginning of the week. Starting on Monday, just 2 days after finishing an ultra distance. And so after a good night of sleep I left the house early in the morning with the plan to go for a two hour run. I had taken the day off from work so I had all the time in the world. 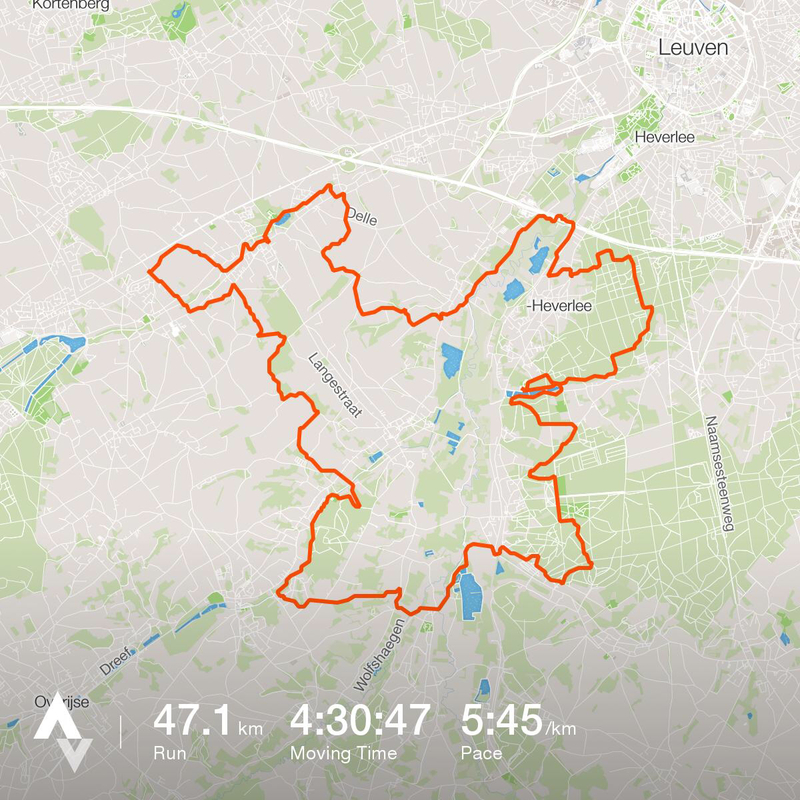 And so it became 24,5 km for the first run of the week. 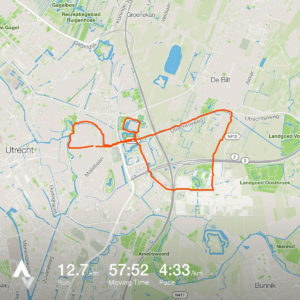 Pleasantly surprised by being able to cover this distance without problems and without any real recovery time from the Lommeltrail. Since I had to be at work today the best option was to run in Rotterdam, luckily I did not have any appointments in my calendar until 10 AM so I had a bit of time to go for a long run. 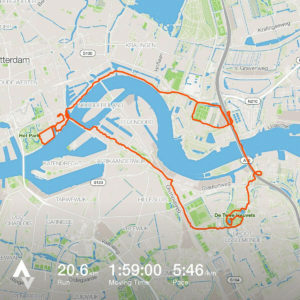 And so after an early drive to Rotterdam I left the office at 7 AM to go for a 2 hour run. 2 hours and a bit over 20 kilometers later I arrived back at the office, time for a shower and breakfast and then the workday. Even though the alarm goes off very early in the morning, you could even argue if 5 AM is actually morning or if it should be considered night time, it is worth it every time. Getting my training in before the workday actually starts works great for me and the added benefit is that I am used to running at a time when most other people are still asleep which hopefully will make it easier to run from midnight to morning during the Bello Gallico trail. 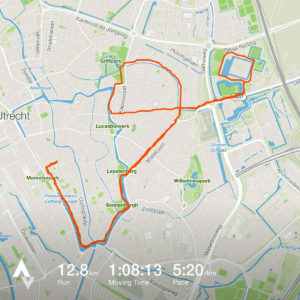 Since I would be leaving the office early to go to the conference this afternoon I only had time for a short run, but that fitted in nicely with how I had built up my week. With the long runs on the first few days I had chosen today for a bit of speedwork. And so I went out for a short run of an hour and wanted to throw some speed in it without blowing myself up. And so I ran relatively comfortable for an hour at a pace of around 4:30 / km. A nice workout and fun to experience some speed again. In the evening Astrid, myself and one of my colleagues drove to the XP Days Benelux conference we would be attending the next two days, after arriving there we headed for the bar. This was not going to be a night with a lot of sleep…..
After just about 5 hours of sleep, the alarm of my phone goes off. It is 5 AM and I want to get a run in before breakfast and the start of the conference program. The conference is in a small village which typically don’t have a lot of street lights. For me that means an extra chance to run in the dark with a headlight on. And so at around 6 AM I am leaving the hotel with my Petzl Nao on my head. 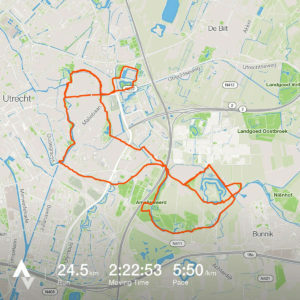 I run a short round around the village and when I arrive back at the hotel, I notice a small running trail in the forrest that surrounds the hotel. Of course I could not let the opportunity of a few dark trail kilometers pass and so I ran through the forest for a bit. Time for a bit of rest and to enjoy the conference. And then later on the day an e-mail from the organizers of the Bello Gallico trail. Unfortunately they did not come to an agreement with the local authorities to be allowed to run at night through the area for the Bello Gallico trail. 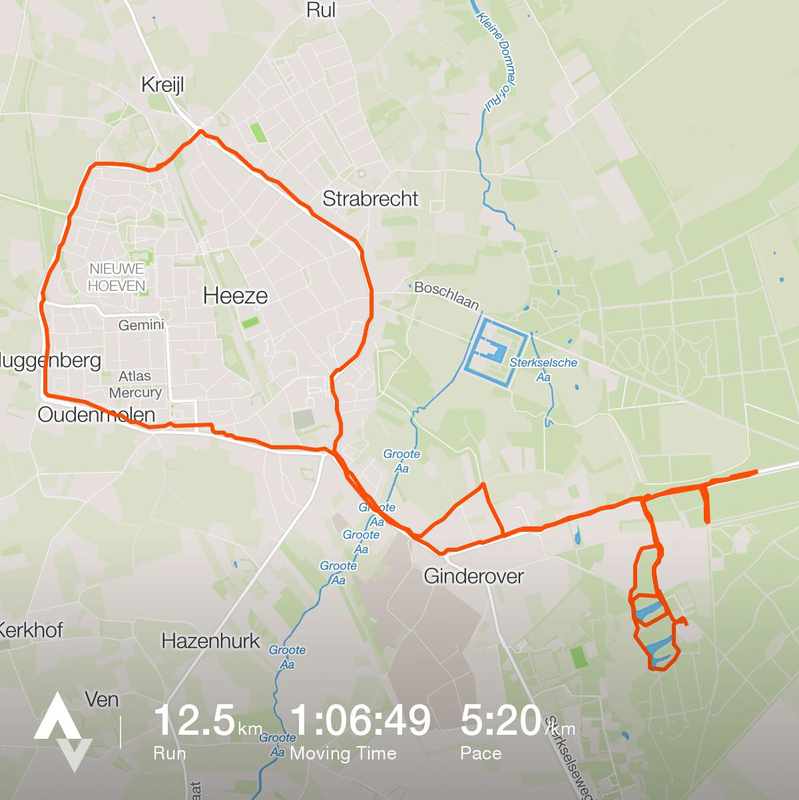 Leaving them with only one reasonable option, moving the entire event to a different location in Belgium and as such a completely new course for the run. This basically means that my recon run of the course 3 weeks ago suddenly is nothing more than just a nice training. I quickly decide to plan another recon run of the new area for the upcoming weekend to at least have a rough idea of the terrain and the course. I am using the second day on the conference as a resting day, no running today, just enjoying being at the XP Days Benelux conference with some old and new friends of the agile community. On Saturday I did not really have a reason to go for a run, I would be doing a long run on the new Bello Gallico course on Sunday so Saturday should be an easy day and should definitely not challenge me too much with an ultra distance ahead of me. But the weather was great and I really felt like running and so I could not resist and went out for a short run but I kept the pace and heart rate low to save my energy for the next day. 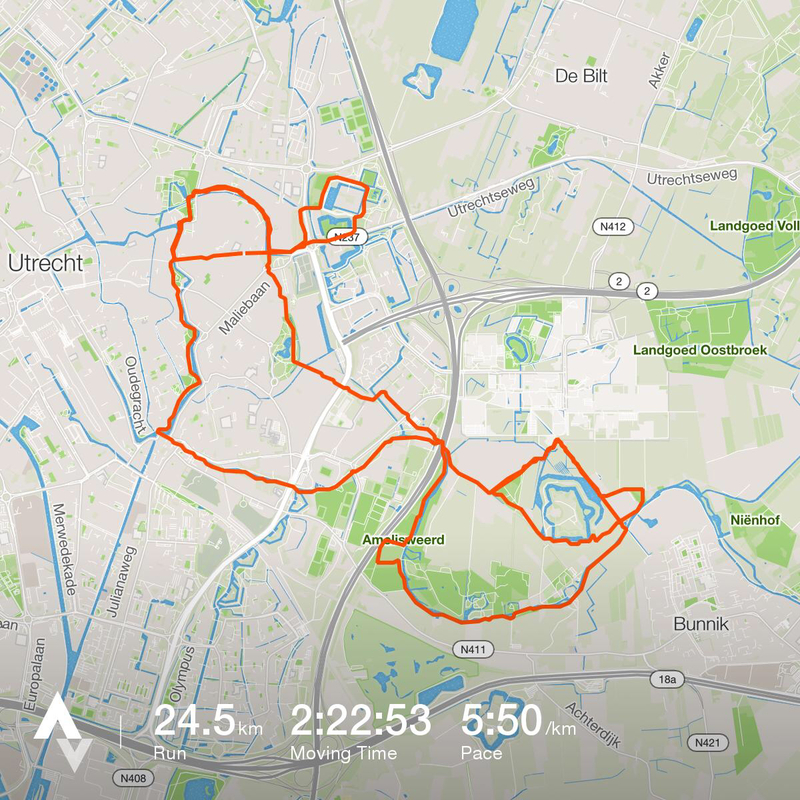 After a bit over 12 kilometers on my favourite course in the neighbourhood I arrived back home, a nice start of the weekend. With the Bello Gallico race changing locations and this beeing the last weekend in which I have a car available this was the last opportunity to check out the new course. Race director Stef had quickly put a GPS route together for me that, while it was not the definite route of the race, would give me a good impression of the terrain and the challenges. And so on Sunday morning I left Utrecht at 6 AM to drive to Oud Heverlee, the starting point of the course. Unfortunately there were some highways closed in the Netherlands due to construction work on these roads which meant my drive to Belgium took 2 hours and 45 minutes, almost a full hour longer than in normal traffic conditions. After having paked he car I quickly get going and within a few minutes I am on my way on the course. The area is really nice, I start at the official start location and after a few hundred meters on the road I already find myself heading into the forrest on a tight singletrack trail alongside a beautiful view over the water. This first part is physically challenging due to the slippery nature and the thick layer of leaves on the ground. After about 20 minutes Tim, one of the race directors, sends me a message that he is at the 5 km mark. After turning a few more corners I can already see Tim standing there and waiting for me. I blink a few times to see if my eyes are not deceiving me, but they are not, he is actually wearing shorts while it is just 5 degrees outside. 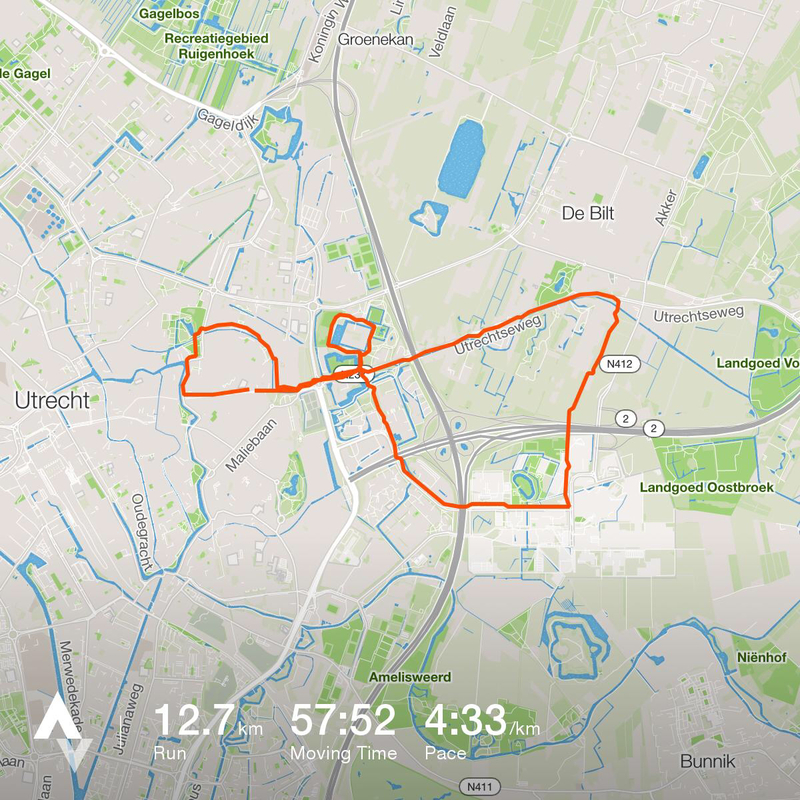 We have a short chat and I am back on my way, I still have 42 kilometers of running left ahead of me so I better get going to make sure I am done before the sun sets. I notice the amount of tarmac in the course, which is a pitty but at certain times it is a welcome part of the run since it allows me to recover a bit. Most of the course is either going up, down or zig-zag not really allowing me to get in a stable running cadence. After 29 kilometers I pass the small village Leefdaal. I have deliberately modified the course to pass through this village since I assumed that a refill of water and something else to eat than the energy gels and bars I was carrying would be welcome. And so I visit the local grocery store to buy myself a bottle of water and a small box of cashew nuts. Sitting outside I refill the water container in my race vest while chewing on some cashew nuts. I put the remainder of the cashew nuts in a plastic bag and put them in my race vest and after this short break I am on my way again, 18 kilometers remaining. The course is tougher than what would originally have been the location of the Bello Gallico trail. Elevation changes and tough muddy tracks make it difficult to get into a steady pace. I put on some music, it’s focus time, I just want to get this done. With 2 kilometers to go my phone rings. It’s Stef, he asks me where I am on the course and that he will meet me at my car. After 10 minutes I am approaching the parking lot and Stef is already walking towards me. We greet eachother and briefly discuss the course and what I think of it. The new Bello Gallico course is more challenging than the original one, it has more elevation changes and tougher terrain. But it also hase more tarmac in it. If I would have known up front that this would be the course I would be running on I would have spent more time training on hills and a bit less on long steady paced endurance runs. But we will see how it works out. Tim and his wife Frederique and their kids also arrive at the parking lot. After a drink together we all head home, where I arrive 2 hours later. 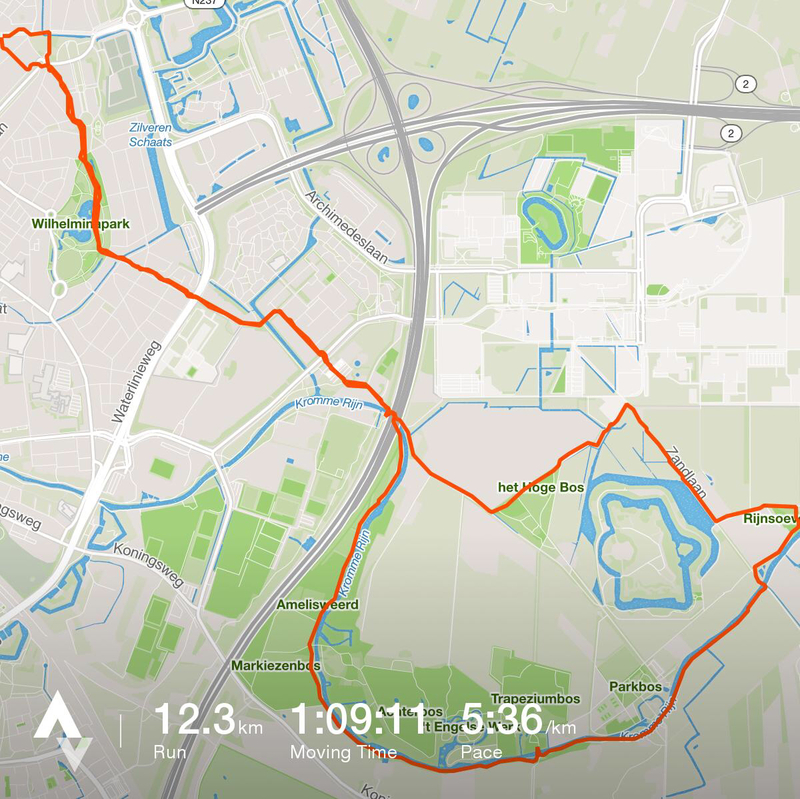 Happy that I have managed to squeeze this recon run in, but also happy that the week is finished. As the new week starts I leave our comfy house at 6 AM to drive to Rotterdam for another day at the office, one of the last. This is my last pre-workday run in Rotterdam, at least for now it is. In September I had decided to quit my job and my last workday is on Tuesday the 29th of November, just a day away. 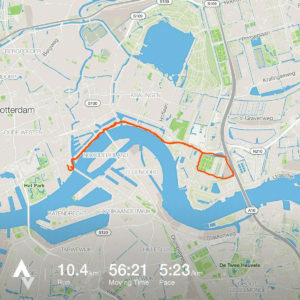 On this cold morning in Rotterdam I run along the river “De Maas” as I have done numerous times over the past 2 years. I stare over the water while running, taking in this moment. After I finish my run I take a deep breath and enter the office, time for a shower and breakfast. Today is my last workday and I don’t have a new job ligned up to start on. this is how I have chosen it to be and it feels like the right way to go for now. 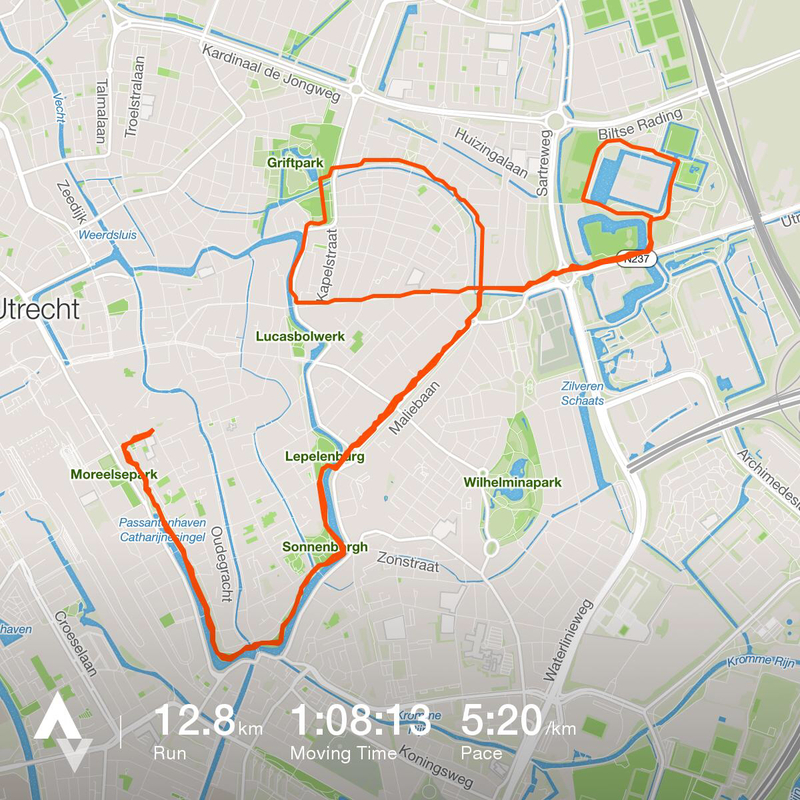 I start this day with a short run in Utrecht with a bit of speedwork in it. Running 10 kilometer at an easy pace and then adding in a quick 2 kilometer to give those leg muscles a bit of a workout. With a weird feeling in my stomach I get my things together and head to Rotterdam for my last workday. The day is a busy day with a lot of last minute talks to several colleagues and a fun team event in the afternoon and diner in the evening. At 21:00 I head home by public transportation, jobless, the end of an era. Time to look forward. So this is my first day as an unemployed person, or should I say self employed? It’s a thin line but I will stick with the latter as that seems to be the direction where I am heading. No running today. Today is the day I will get locked up in prison. No that’s not the reason why I quit my job. I was offered the opportunity to join a Prison Day by my friends Sandra and Jeroen. 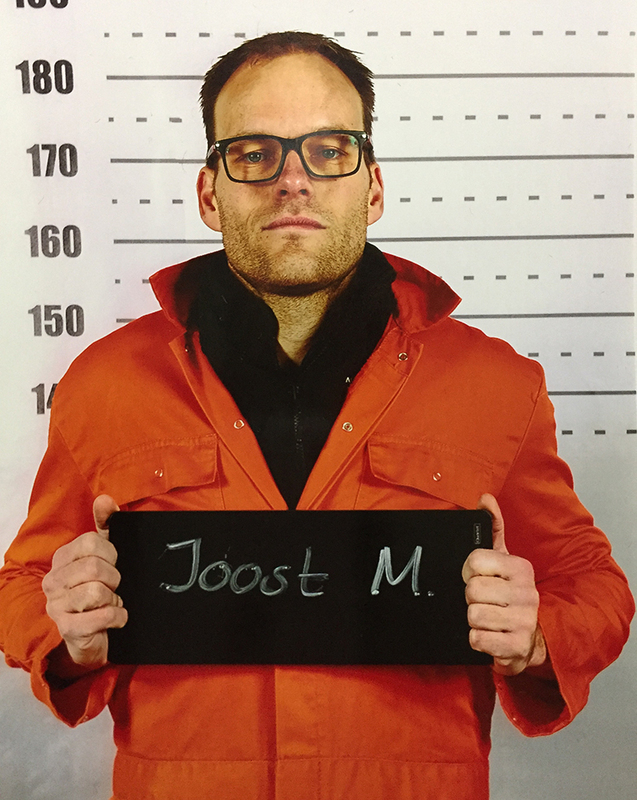 Prison Day is a concept that is intented for self reflection. You get locked up in a cell with nothing but your own thoughts to work on. Perfect timing for me since I had just quit my job and need to figure out what I will be doing next. This day was interesting, it gave me new insights, confirmed existing ones and forced me to put certain thoughts aside to make the day a useful experience for me. I will elaborate more on it in a separate blog post soon. Just 17 days to go. As the month of November is finished there are just 17 days left until the start of the Bello Gallico trail. Just 17 days……. In the upcoming last few weeks I will be looking to put the dots on the I in my training. What are those dots? Mainly keeping the fitness level that I have and maybe improving that by just a little bit and working a bit more on improving my core and strength in my legs. Besides the training there is also all kind of others things I need to get done such as deciding on the contents of my race vest, what should be in my drop bag, purchasing the last items I need and what music I want on my iPhone. I am looking forward to these last trainings and oddly enough, for the first time while working towards an event I am actually looking forward to the tapering during the last 7 to 10 days before the start.